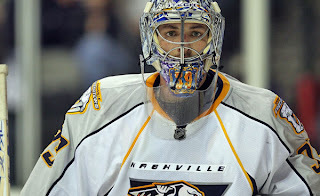 The revamp of the Predators roster continues as Nashville traded the rights of soon to be unrestricted free agent goaltender Dan Ellis and restricted free agent forward Dustin Boyd along with undisclosed future considerations to the Montreal Canadiens for the rights to restricted free agent Sergei Kostitsyn and future considerations. Ellis was in the final year of a two year, $3 million dollar contract with the Predators, and he had made it known that he was looking for an opportunity to secure a starting role with a team. That option with the Predators no longer existed as Pekka Rinne had played himself into the starter's role with a strong performace in the last part of the 2009-2010 season. Ellis is articulate and personable and will be missed in the Predators locker room. If he signs with the Canadiens, he will be a solid addition to the team that will push putative starter Carey Price. The Predators picked up Dustin Boyd from Calgary at the trade deadline last season for a fourth round draft choice in 2011. Boyd showed flashes of solid play, but his ice time was limited to mainly third and fourth line duty. In picking up the enigmatic Sergei Kostitsyn, the Predators get a player that posted 27 points in 52 games for the Bleu, Blanc, et Rouge in his first season with the team. The left winger has the potential to fill a hole in the Predators roster, and if he can regain his early form could be a valuable addition to to the Predators roster. Kostitsyn comes with a checkered past, however, and General Manager David Poile is very aware of the problems that have surrounded the young Russian since joining the Habs. Kostitsyn has been described as being a divisive locker room presence; he, along with his brother Andrei, were rumored to have ties to the Mob in Montreal (no, not the mob that burns cars after a Montreal win or a loss. THE Mob). Kostitsyn has openly battled with his GM about playing time. In response, he was benched then told to stay away from the team because of his negative influence. Which begs the question, why attempt to bring a player to Nashville that has been so divisive and disruptive? Perhaps the idea is that a change of scenery will be good for Kostitsyn. Given his past, I would certainly not hang my hopes on that fact alone. Yes, that may be part of the equation, but there is more, in my opinion. The Predators are a chance at redemption. Nashville offers a chance at more playing time, and if productive, an opportunity at a much more prominent role than he would have had in Montreal. It's no secret that the Predators need scoring and they need productive left wingers. Kostitsyn has the opportunity to come in to a situation that, if he shows maturity and a strong work ethic, could allow him to blossom. It will be interesting to see if David Poile can get Kostitsyn signed. If he does, how will he fit in to the Predators locker room and into an environment that is markedly different from the one he found in Montreal? It will be a challenge for the Predators to mold a potential talent. It will be a challenge to Kostitsyn to adapt to a new way of life in a smaller hockey market. Sergei, my one piece of advice to you would be to learn to say "привет, вы все" quickly.